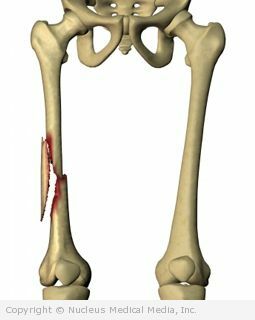 A femoral fracture is a break in the thigh bone, which is called the femur. The femur bone is also known as the thigh bone. It runs from the hip to the knee and is the longest and strongest bone in the body. It usually requires a great deal of force to break the femur. The doctor will ask about your symptoms, physical activity, and how the injury occurred. The injured area will also be examined. You may have x-rays to look for a break in the bone. Your doctor will order additional x-rays while the bone heals. This is to ensure that the bones have not shifted position. Once home, follow your doctor’s discharge instructions. When your doctor decides you are ready, you’ll start range-of-motion and strengthening exercises. You may be referred to a physical therapist to assist you. Do not return to sports until your leg is fully healed and your thigh muscle strength is back to normal. A fractured femur is a serious injury that takes 3-6 months to heal. Do not put yourself at risk for trauma to the femur. Femoral fracture has been linked to osteoporosis (thinned bones) in people over age 55. Be sure to find out whether you have osteoporosis. Follow any treatment recommendations for this condition to help prevent further fractures.